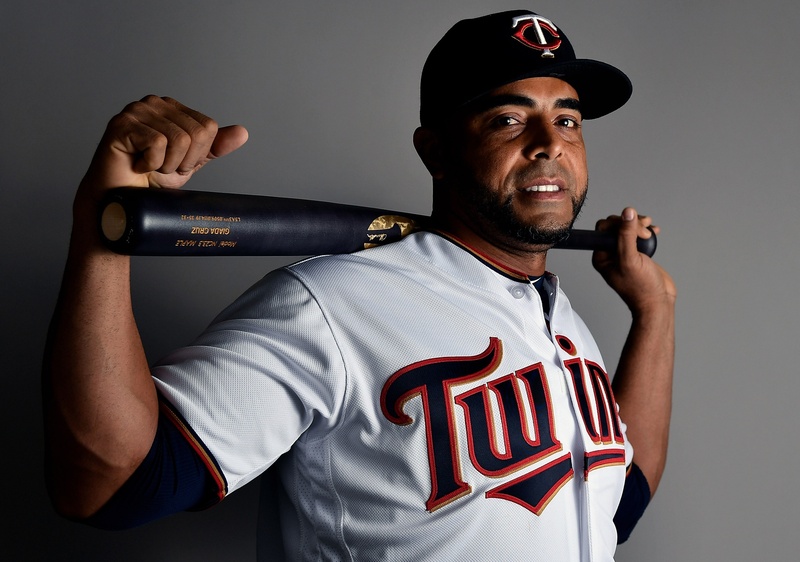 FT. MYERS, FL – During the offseason, the Minnesota Twins signed perhaps the best power hitter in baseball. Not only that, but one of the best hitters period – among all MLB players in the past five years, Cruz ranks 13th in OPS and 15th in wOBA. He's one of the biggest-name free agents this team has ever signed. Twins fans are gearing up for a show the likes of which we've rarely seen. Cruz's power is notable from any perspective, but especially in the context of his new franchise. If the slugger merely matches his lowest home run total from the past five seasons (37, in 2018) it'll be the second-highest mark by a Twins hitter since 1970. Only Brian Dozier's total of 42 in 2016 tops it. But Cruz is more than a power hitter. He brings modest patience to a free-swinging lineup. His leadership draws acclaim from all sources, including a guy who built a nice career for himself around similar traits. MLBPA director Tony Clark was at Hammond Stadium on Friday, making his usual spring rounds. When asked about his position on extending the designated hitter rule across the league, after it was noted that someone like Cruz can find a job much more easily with such a role available, Clark went out of his way to praise the Dominican native. "Nelson is as good as they get," Clark said. "I'm not talking about as a hitter; he's one of those too. But I think it's fantastic that you guys will have an opportunity to spend some time with him and see him, and how his leadership qualities manifest in the clubhouse." Rocco Baldelli, still finding his way as he navigates his first spring as a manager, might be especially appreciative of the 14-year veteran's established cred. "He's a pro in the clubhouse. Once he steps on the field, all the work he does pregame, very helpful as a staff member, manager," Baldelli said. "It's a great luxury to have this guy on a team." Of course, it's not surprising to hear folks lauding Cruz's power and presence. One thing that HAS been a little surprising is his spryness and base running savvy at age 38. On Saturday in Sarasota, he had an impressive sequence where he hit a rocket off the left field wall that got back to Baltimore's Trey Mancini in a hurry. He could've easily settled for a single, but instead lowered his head and sprinted toward second, sliding in with a double. That hustle paid off, because on the following play he scampered home on an Eddie Rosario single to center, offsetting his lack of footspeed (which last year ranked 505th out of 549 qualified big-leaguers) with a huge secondary lead that Baldelli raved about postgame. Earlier in the week, he'd made his spring debut in the outfield, where he also showed better than expected. "Nelson looked pretty good out there and tracked some balls down," Baldelli observed after Monday's game. In particular, the former center fielder was impressed with Cruz's awareness on one play where he aggressively charged in to make a catch with C.J. Cron playing in at first. "If you don't break after that ball immediately, and realize that there's no one there for it, that ball could fall." Cruz showed his playful side in the top of the first when he trotted out to center field and started playing catch with "right fielder" Byron Buxton. This caused a few triple-takes in the press box, and even prompted the second base umpire to walk out and ask what was going on. Buxton and Cruz soon swapped back to their assigned spots. "Everyone was surprised, I don't know why," Cruz said in the locker room afterward with a shrug and a smile. Even if Baldelli was impressed with this defensive showing, it hasn't altered his plan to have Cruz "DH-ing a vast majority of the time." But, as the skipper noted, "It's nice to know it's an option." Ultimately, everyone knows that Cruz's biggest impact will come in the lineup. His prodigious power looms especially large with Miguel Sano set to miss at least the first month. Cruz's baseline production over the past five years – .281/.356/.541 with an average of 41 homers – is pretty much exactly what Twins fans are optimistically envisioning for Sano. In fact, it's noticeably similar to Sano's .276/.368/.538 line at the 2017 All-Star break, at which point he was on pace for 38 bombs. Should Sano return and find that form once again – granted, a dubious proposition at this point – the Twins could feature one of the most intimidating 3-4-5 runs in baseball with Cruz and Rosario preceding him. And either way, Cruz is extremely confident in the group around him... not to mention himself. "Very athletic lineup we have," Cruz opined, adding with a grin, "including myself." After all we've seen this spring, who could argue? I enjoyed watching Kent Hrbek fool around at shortstop during fielding practice, back in the day. Cruz in CF is about on a par with that. Great signing by the FO. Thanks FO. Seems like so far that the guys they signed this year don't seem bitter like a couple of the guys last year did, they seem like positive influences inside the clubhouse. Hopefully that holds up as the young core from this team needs those kind of guys to follow. i am SOO EXCITED to see these turn it loose!! GO TWINS!!! Show me the money. Or in other words lets revisit this at the all-star break and see how he's doing. It was a good signing. Hopefully it pays out, but it was definitely worth the (relatively small) risk. Good to see that Cruz seems capable of playing OF enough to stay in the lineup in interleague play as needed, but it seems unlikely we'll see him out there outside of interleague play IMHO. Not only one of the biggest hitter the Twins have ever signed, isn’t his contract literally the biggest FA contract they have ever signed, on a per year basis? When I saw this headline “Cruz Control” I thought it was in reference to him being “player-manager” today. Is Cruz a potential future coach? Ha, that would've been quite prescient! "It's funny you say that. In the dugout what we were all commenting on and talking about was the way he ran the bases, the way he took his secondary leads when he was out there, he might've taken the biggest healthiest secondary leads really of anyone all spring, and we're talking about a 38 – what is he 38? – 38-year-old guy taking pride in stuff like that. He scored on a base hit where it was actually a very direct example of, he scored because of the types of leads and secondaries, and the way he goes about his business on the bases. It was actually really cool to watch." "He leads by example, he goes out there and does it. At this point in his career, I don't know if every guy that's played that long takes pride in those sorts of things. It's very special when you do get to watch something like that. He does it by showing everyone how to do it, and then he also comes in the dugout, into this clubhouse and talks about these things. So, couldn't ask for anything else." Byron Buxton: Reckless or Aggressive?